There’s no doubt that English born model and actress, Rosie Huntington-Whiteley knows how to dress. Her eternally chic and sophisticated style is as on point running errands as it is on the red carpet. From fitted trousers suits to sparkling princess gowns, Rosie’s individual style is truly inspiring. Browse our edit of dresses inspired by Rosie and feel undeniably fabulous as you step out for your next event. When it comes to high profile events, Rosie Huntington-Whiteley is the queen of timeless dressing with a modern twist. She effortlessly combines structured silhouettes with more contemporary elements that allow her to stand out from the crowd. The Rain embroidered silk-blend mini dress by Zuhair Murad is a classic example of that style. This stunning dress combines powerful structured shoulders with a more delicate all over floral embroidery. We adore the soft pink tones that shimmer gently atop the sparkling black embroidery underneath. Additionally, the cinched waist ensures a defined shape whilst the silk-blend skirt offers a flawless drape. Finally, the long sleeves are elegant and stylish combined with the decorative mini hemline. Style this fabulous dress with high heeled sandals for a memorable entrance. For an eternally classic and flattering look, opt for the Enverse satin black dress by MSGM. This fully lined tuxedo style dress is incredibly chic and will certainly make the most of your figure. You’ll adore the stylish crossover neckline and simple decorative button accents. Style this with simple heels and accessories to maintain a perfectly polished appearance. These days, Rosie Huntington-Whiteley is no stranger to the bright lights of Hollywood. Since steering her careers efforts from modelling towards acting in recent years, she has graced many red carpets. Do as Rosie does and keep your gowns classic and elegant. 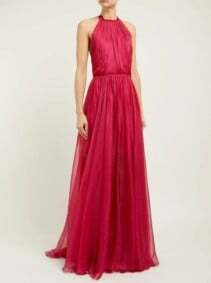 Just like the Eslem pink halterneck dress by Maria Lucia Hohan. The raw-edged halter neckline ties behind the neck in a statement bow that drapes beautifully down the open back. 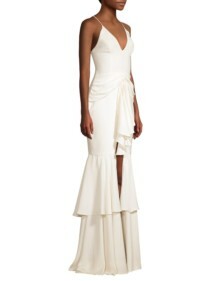 This dress is also made in a pleated silk mousseline with a skirt that descends dramatically from the raw-edged waist. Slip into this breathtakingly romantic pink gown for your next evening out. 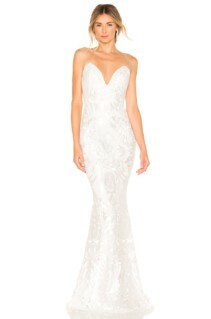 If you’re pining for something fitted we highly recommend the Noel and Jean The Lady ivory gown by Katie May. The expertly embroidered ivory mesh fabric is truly striking especially combined with the barely-there mesh shoulder straps. In addition, the padded bust and boned bodice sculpt your figure for a showstopping silhouette.